More story research has led me to reviewing Essential Oils and Aromatherapy. 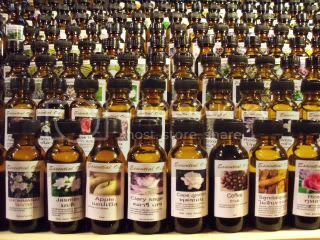 I'm intrigued, check out the first half of the list I found for a few of the oils out there. 1. BERGAMOT (CITRUS BERGAMIA) - Uplifting, refreshing and relaxing. Encourages cheerful emotions and ideal for depression. 2. CEDARWOOD (JUNIPERUS VIRGINIANA) - With a dry woody aroma, this oil is ideal for soothing, harmonizing and focusing the mind. 3. CHAMOMILE (ANTHEMIS NOBILIS) - With its distinctive apple, herb aroma this oil aids sleep and soothes tired muscles. 4. CLARY SAGE (SALVIA SCLAREA) - Deeply relaxing and euphoric. Eases feelings of depression and helps when feeling run down emotionally and physically. 5. CYPRESS (CYPRESSUS SEMPERVIRENS) - A rich woody aroma helps to build emotional and mental resolve. 6. EUCALYPTUS (EUCALYPTUS GLOBULUS) - The well known aroma is stimulating and cleansing, especially in the winter months. It is a powerful, penetrating bactericidal and anti-viral oil. 7. FRANKINCENSE (BOSWELLIA CARTERI) - Aids meditation, fortifies and quiets the mind. 8. GERANIUM (PELARGONIUM GRAVELOENS) - Sustaining, relaxing and restoring. It has a strong strengthening effect, balances emotions, raises energy reserves while soothing the mind and body. 9. GRAPEFRUIT (CITRUS PARADISI) - Refreshing and reviving, especially when feeling down. This oil clears the mind and uplifts the spirits. 10. JASMINE (JASMINUM OFFICINALE) - The heady, exotic perfume uplifts and nurtures as well as boosting confidence. An emotionally warming sensual oil. 11. JUNIPER BERRY (JUNIPERUS COMMUNIS) - Purifying and eliminating with a clear woody aroma. This oil clears emotional overload and helps to cleanse the body of impurities. 12. LAVENDER (LAVANDULA OFFICINALIS) - Clear light flowery aroma, versatile oil for relaxing and balancing for mind and body. Aids sleep, soothes tired muscles, benefits the immune system, and encourages stillness and tranquility. 13. LEMON (CITRUS LIMONUM) - Refreshes and cools bringing clarity to mind and emotions restoring vitality acting as a tonic to the circulatory system. Oh yay! I use essential oils all the time, and wish I could afford them ALL!!! Lavender, eucalyptus, jasmine are fantastic... so is grapefruit... also, I use clove bud... cinnamon oil is incredible, too! Frankincense is extremely expensive because it's so hard to get... however, it has all sorts of healing properties, including being anti-cancer. Ummm...lemon. Just so refreshing and clean smelling. Serena, one of the best sites for research, imo, is Young Living... they have topline essential oils. If you go to products and click on essential oils, they have single oils and blends. It's been awhile, but they gave the medicinal benefits, sometimes the history, etc. Shop online for Essential Oil and Aromatherapy products. Pure, theraputic-grade essential & aromatherapy oils from Young Living.